The price of WTI crude oil fell below $48 a barrel today (Wednesday) after the Energy Information Administration (EIA) reported a ninth straight weekly climb in crude supplies. By 1:30 p.m. today, WTI oil prices were down 1.31% to $47.66 a barrel. WTI had already dropped 3.4% on Tuesday due to weak equity markets and U.S. dollar strength. Brent crude prices moved up for the first time since March 5. 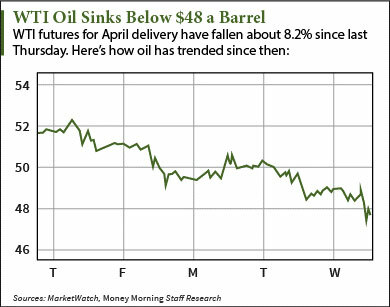 Futures for April delivery gained 1.02% to $57.45 a barrel. Inventories increased by 4.5 million barrels last week. Analysts polled by Platts only forecasted a 4.2 million barrel increase while the American Petroleum Institute predicted a fall of 404,000 barrels. Reserves in Cushing, Okla., the delivery point for U.S. oil futures, saw a 2.3 million barrel increase. Last week's total supply was 51.5 million barrels – topping 50 million for the first time since May 2013. "Lots of crude – that's been the theme, it's still the theme, I don't think it's going to change anytime real soon," said Kyle Cooper, analyst at IAF Advisors in Houston, to The Wall Street Journal. If WTI closes below $48 today, it will be the lowest settlement since Jan. 29. Low oil prices means many operators are shrinking their future production. This will cause a "reserve crunch" that will reverse the oil price slump. For instance, Royal Dutch Shell Plc. (NYSE ADR: RDS.A) reported last month that it had replaced only 25% of its 2014 production. That means the company used just 300 million barrels of new reserves to replace 1.2 billion barrels of production. "There's very little reason to continue producing excessive amounts of crude if it's merely going to depress the price," Moors noted. "But this is the kind of crunch that promises to have a big impact on both crude oil prices and stock valuations."